BERLIN - Down by one at the end of the third quarter, the Berlin boys basketball team needed a strong finish to take down Hartford Public. To say the team got that strong finish would be an understatement. The Redcoats dropped 30 points on the Owls in the final period to pull away for an easy 75-56 win at home. Berlin outscored Hartford Public by 20 in the fourth quarter to earn its second straight win. 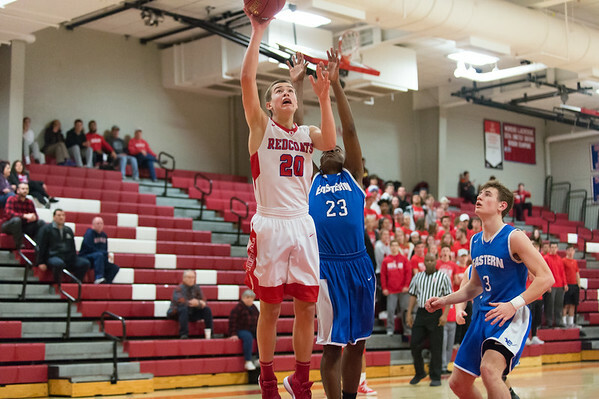 Holden Murphy led the Redcoats with 26 points, including eight in the fourth quarter. Giancarlo Tufano added 13, with seven coming in the closing period. Ryan Hyde added 10 assists to go along with his eight points, while Gianni Fanelli pulled down eight boards in addition to scoring eight points as well. Innovation 76, Aerospace 28: The Ravens used a torrid 49-point first half to put Monday night’s game with Aerospace out of reach early, taking a 37-point lead into halftime thanks to electric performances from LJ Hazelwood and Carlos Gonzalez, who finished with 16 and 13 points respectively. Lenny Okonya and Clinton Allen added 12 points apiece for the Ravens, who had four different players finish in double figures as they moved to 15-1 on the season. Newington 38, Berlin 35: The Indians continue to climb up the Class LL ranking. Ashanti Franzier finished with a game-high 18 points and eight rebounds and Alexie Armour added seven points and nine rebounds as Newington outdueled the Redcoats in a closely contested game. Lyzi Litwinko scored a team-high 16 points for Berlin with Ashley Wenzel contributing nine. The first half proved to the difference in the end. The Indians went into halftime with a 25-14 lead and managed to hold off a flurry of Redcoats’ points in the third quarter. Berlin outscored Newington 17-9 in the third. But neither team was able to score much in the final eight minutes, allowing the Indians to come out with the win. Aerospace 48, Innovation 22: Down just one point at the half, the Innovation girls basketball team didn’t come out with the same intensity for the final 16 minutes and fell to Aerospace on its home court. Innovation was outscored 31-6 over the final two quarters after heading into the locker room facing a 17-16 deficit. Ariana Rivas led the Ravens with eight points, while Te'ijah Roberts contributed six. Ashanti McLean led the Jets with a game-high 18 points. Posted in New Britain Herald, Berlin, Innovation, Newington on Monday, 4 February 2019 22:00. Updated: Monday, 4 February 2019 22:03.